No wonder Canucks medical staff couldn't figure out what was wrong with him. Hopefully he didn't also inherit the douche gene from his pops. TBL re-signs 26 yr old, 27 in Dec., 5'9 172lbs LW Yanni Gourde to a six-year $5.16M per contract, 3yr NTC, 3yr M-NTC, they let him develop 3 years in the AHL with some NHL games here and there before they gave him a full 82 games last season where he had a monster season. Doesn't even have a problem roughing it up. The Kings have relieved coach John Stevens and assistant coach Don Nachbaur of their duties. More changes to come from Kings in an announcement in about 30 minutes. And ol Willie is back again! Is LA big enough for Twitch’s moustache? Poor Willie. Another old team with big contracts. Who makes room for Linden Vey? Wow, I never would have dreamt Willie`d get another gig in the NHL. Wonder what they see in him. LA sees something Real Good. LOL, TSN uses the classic "Clipboard Willie" image. "What was that, magic clipboard? Get Linden Vey? Ok."
The well gripped clipboard returns. The lip licker from Climax will set the city of angels on fire! Guess he wasn't much on "the code" either. At least not that I recall. Funny isn’t it. We wanted Stevens as coach but LA would not give us permission to talk to him. So we hire Willie. Now Stevens is fired only to be replaced by.....Willie! 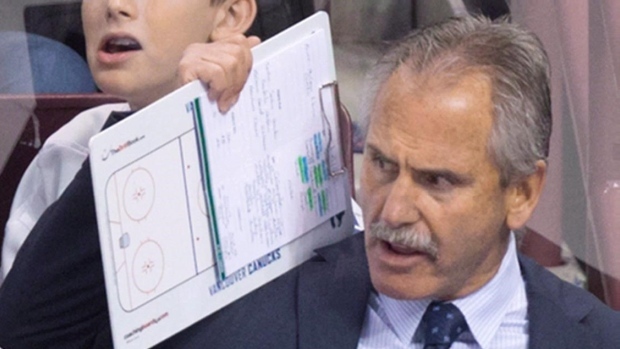 Of all the Canucks ex-coaches to hire! Ummm hellooooo... Vigneault and Crawford are available. Hell even the lunatic Keenan might have been a better choice. I thought the Stevens talk was in 2013. When the Aquilinis slapped Eye Bags in the snout and hired John Tortorella.